Debra, I would like to thank you for sharing your great knowledge and teaching us about HypnoBirthing® for all of us seeking a natural birthing experience. HypnoBirthing® changed the way I perceived birth forever. It gave me all the true knowledge about how the body and the baby beautifully work together during labor, and most important it gave me the power to believe that I could have a success birth story if I just wanted to. With these tools in my hand I embarked on a journey where I my mind had one goal, to birth my baby naturally with the techniques taught in our HypnoBirthing® classes. The visualization and relaxation techniques were an important part of my preparation for the birth of my baby as they helped me to keep focused on my goal and stay relaxed. They allowed me to block any & all negative thoughts knowing that I was able to have the birthing experience that I visualized. 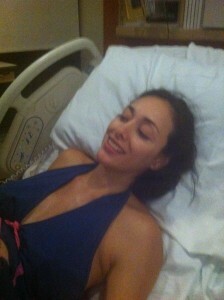 As I continued to labor, the breathing techniques and your massages were the key in keeping myself serene and relaxed during each labor surge, just letting my body and baby work together. Putting into practice the techniques I had learned in your class, I was able to dilate to 7cm and reach 100% effacement by the time we reached the hospital. My son Derin Efe Yazici was born 10 hours after arriving to the hospital on May 12, 2012, weighting 8.4lbs. My husband and I know for a fact that your guidance and support with HypnoBirthing® made this possible, and we are look forward to repeating this experience for our second child in the near future. Patience & Relaxation Mariana uses HypnoBirthing techniques with Doula Debra and best friend Carolina. Almost 10 cms breathing baby down! HypnoBirthing really works to reduce labor stress and help mothers enjoy the journey of birth together with your baby! Cecelia using HypnoBirthing techniques with Doula Debra to help baby move down easier and without strain or unneeded discomfort. I am proud to say that I birthed my baby Aug. 23, 2011. His name is Luke Cameron and he weighed 6.5lbs/21 inches. 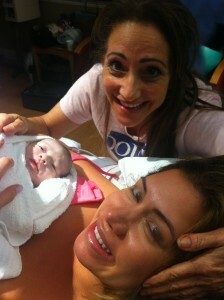 HypnoBirthing, I believe played a Critical role in the success of my birth experience. I came into the course a bit anxious about birthing and believe the prenatal yoga and HypnoBirthing course helped with my focus, deep breathing & relaxation. I was totally in my own mental state. My doctor even said he was very impressed that I was so focused. In the video of my birth I noticed that I was in my own relaxed state of mind. So for me, my story is a successful birth! Thank you for teaching and exposing both me & my husband to HypnoBirthing. It helped make my labor & birth such a good experience! I look forward to Postnatal Yoga with baby! I just wanted to say Thank you for teaching the Hypnobirthing Childbirth classes!! Since I had not gotten a birth buddy yet, I wanted to email You about the story… thought you would be proud to hear about another Hypnobirthing success story. 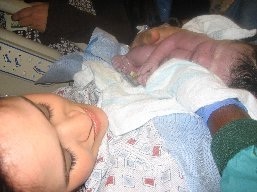 I birthed Mia Lucia MacIntyre on 11/5/09 @ 9:55pm. I DID IT!!! My birthing story started out when I was actually planning to go to prenatal yoga that day… 🙂 LOL. I actually was having surges about 10 mins apart at 6am and my husband and i thought they were not to regular so we decided to go to work that day. He actually works on campus with me. When I got to work, I was experiencing surges 4-7 mins apart but with the breathing it was like having menstrual cramps…very tolerable. I worked throughout the day with just temporary interruptions from the surges. I went walking during lunch and started doing polar bear poses also. I pretty much turned my office into a laboring room! My office staff was on alert and very supportive. I also felt all day like I needed to go to the bathroom. Then at 4:30pm, I went to the bathroom once again and saw a lot of birth show in the toilet. Jackson Memorial Hospital is across the street from me so I walked over with a friend while my husband met me over there. By 6:00pm I was examined by the midwife and she determined I was 5 cms. and baby was at (-1) station. Still doing the breathing and relaxation techniques throughout.. By 8:00pm I was 7cm and by 9:00pm, 9 cm. I felt I was doing good..until that feeling of pushing came… It was Strong and All I wanted to do was to push. No epidural and just 3 birth breaths later she was here. Everyone was in awe that I did all of that in a matter of 5 hours, being my first pregnancy. I naturally tore slightly.. no episiotomy!! The nurse that took care of me said “it can be done and you showed them it can.” Anyway, it was an amazing experience! I am glad I met you and was able to have the birth I always wanted. Looking forward to bringing Mia Lucia to see you soon at Mommy and Me Yoga. Mia Lucia MacIntyre, 11/5/09 @ 9:55 pm.